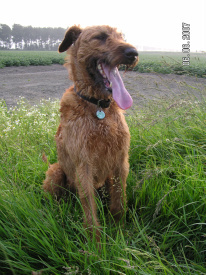 an Irish Terrier. A little unknown fact about the Irish Terrier is that they used to have an important job of putting food on the tables of the Irish farmers. is priceless, almost like a rush. In Holland the countryside is situated on very flat land where you are likely to see many hares roaming around freely, because of this I was curious to see how much of that hunting passion was left in Mister Mac. So with a friend, Ronald Beverdam we would visit Greyhound racetracks in Goes, Holland. After getting permission to let Mister Mac use the track we would let him practise racing alone after the races. They asked me if he could make it all the way round the track at full speed. Knowing just how fast Mister Mac could run Ronald and I could not help laughing as we knew that he was capable of 3 to 4 miles next to to car going at full speed with no problem. (hares can swim) it was really amazing. UK Mac had to live in a terraced house in London. The switch was hard for him, he missed his hunting so much. 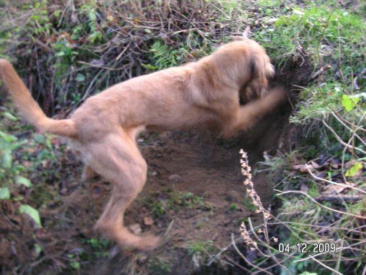 However, he eventually settled into his new home after a few days and discovered that there was still something to hunt regardless of its size. It took him nearly a full week to catch his first pray, which was a little tiny house mouse. Luckily we moved out of London and out to the countryside where he is able to roam in the fields once again. with showing the dogs as a nice extra demension, because let's face it where are the muscles on the show Irish Terriers ??? I am convinced that all this activities will give them something special, the day we enter the show ring which will hopefully happen in the near future.